Two girls, one fabric. It's a party in your pants and jacket. Michelle Brasier (Aunty Donna's 1999) and Laura Frew gift you an hour of absurd fun, high-energy silliness, 90s nostalgia and a lot of denim. Direct from hit seasons at Melbourne Comedy Festival, Edinburgh Fringe, Adelaide Fringe and Sydney Comedy Festival, Double Denim is a kid's party for grown-ups. 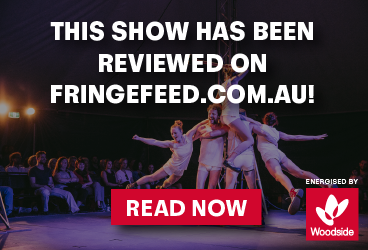 Hey Boss is an award-winning production and management company working with some of the most exciting theatre, music, and comedy shows in the global fringe circuit.